So I had my first ever annual physical this week. I was a little nervous because I wasn’t exactly sure of what sort of tests I would have to do, and unlike all the other exams in my life, I couldn’t cram for this one. As I waited patiently in my stylish blue paper gown for my doctor to arrive, my stomach grumbled. “I’m so cold! I’m so hungry!”, I childishly whined. “I want a cookie! I want a pony!”, jested my boyfriend. He wasn’t far off, I felt like I could have eaten both a cookie AND a pony – fasting for tests is no fun. 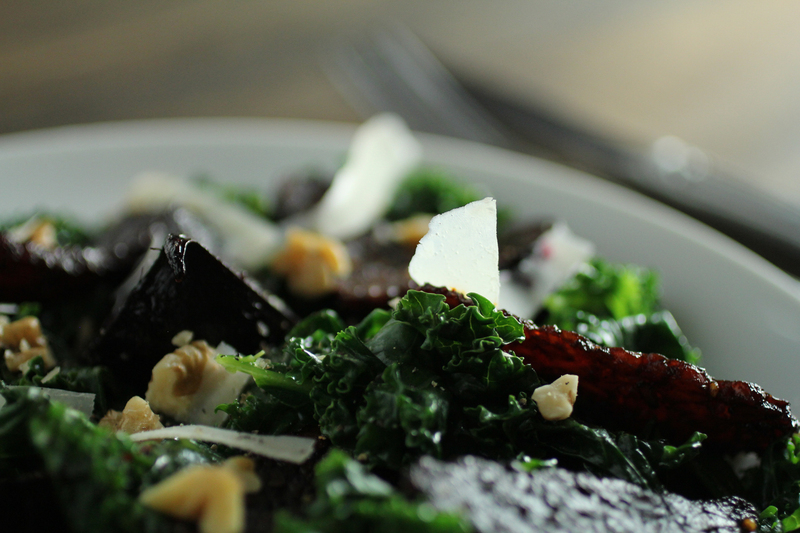 I started to think about delicious things I could eat later that day, but with all these health tests at the front of my mind, I wanted something that was nutritious, and so I decided on a kale and beetroot salad. When I returned home, I popped the beetroots in the oven and after a few longing stares at the oven door, the torture was finally over. 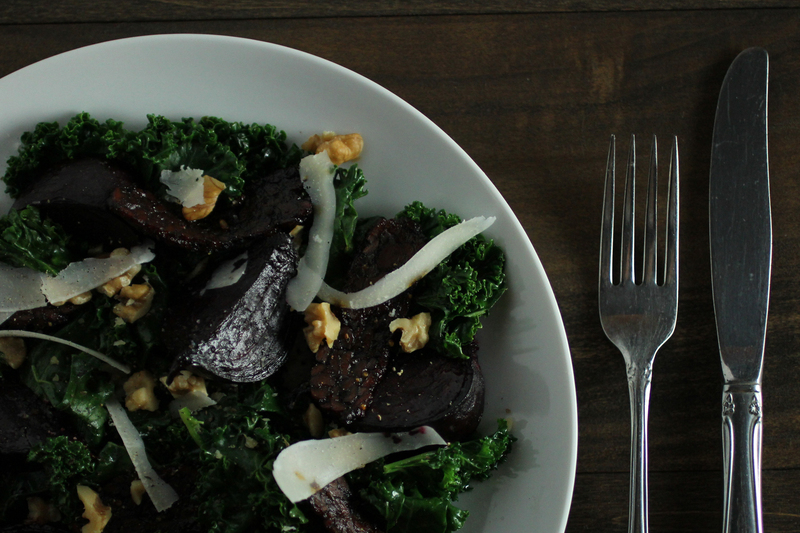 balanced by the sweetness of the beetroots, caramelised in brown sugar and balsamic vinegar. My vegetarian version has moorish nuggets of roasted tempeh “bacon”, bursting with smoky and salty flavours. It might not be a cookie or a pony, but I think it’s pretty close. In a small bowl, combine the balsamic vinegar, brown sugar and olive oil. If the beetroots are large, cut into quarters. Baby beets can be roasted whole. Place the beetroots in a small baking dish and pour over the balsamic vinegar mixture. Season with salt and pepper and cover dish with foil. Place the dish in the oven and bake for 30 mins. After 30 mins, remove the foil cover from the beetroot. Wrap the cloves of garlic and a drizzle of olive oil in some foil and place in the oven. After 30 mins, remove the beetroot and the garlic from the oven. Heat a large pan over medium heat and add 1 tsp of olive oil. Wilt the kale leaves in the pan for a couple of minutes and season with salt and pepper. stir through beetroot juice from the roasting pan. Dress the salad with the beetroot garlic sauce and sprinkle with walnuts and pecorino.